I am in the mood for redwork! It's a beautiful form of embroidery, especially for the holiday season. Not only is it pretty, but stitching redwork is quite simple and fast because you do not have to change thread colors, but can stitch away until your thread runs out! Redwork is the art of embroidery using only one color: red. I used to think the idea was quite boring, as I tend to like selecting color families that work together in a project. But, recently I tried my hand at redwork and have enjoyed both the process and the cheerful finished sampler. The redwork tea towel in the picture above is one I recently embroidered for Val, a friend in the tea towel exchange group I belonged to. Red is my favorite color and I've long enjoyed rework. I am planning a few winter projects, something of this type would be a good one. I too love redwork LaDonna! I can't wait for some time to sit and do some redwork. Thanks for sharing the wonderful link! I love this! I had not heard of redwork as a name, but have admired it for certain! 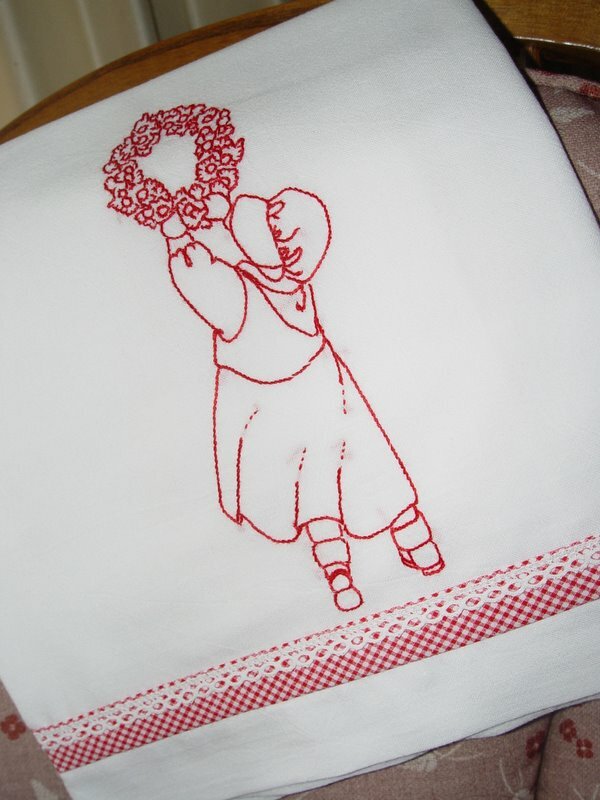 Redwork tea towels are the perfect winter project. I love the designs of your friend and can't wait to see more. I really enjoy redwork, too, for all the reasons you suggest. I'd like bluework, greenwork or any color work, I'm sure. Love your header in all the snow...it looks so cozy. Have a wonderful week, my friend. Thanks for the history of redwork embroidery. I have always been fascinated by it. I think if I took up embroidery again I would love doing redwork. Now I must visit the link, I might just be tempted.